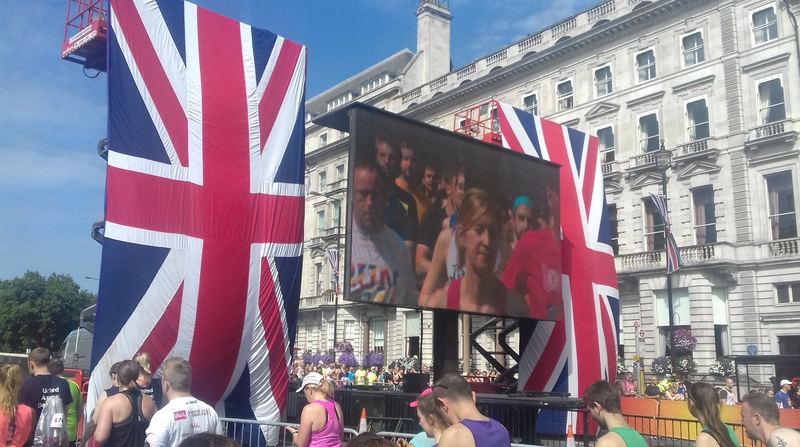 The British 10k was a race I’d been looking forward to for quite a while, maybe not so much for the running – which I haven’t been happy with lately – but for the event itself. I’d read lots about it in the past, about how it was poorly organised etc. but the hope was that with Virgin Sport taking over this year for the first time that all the old quibbles and problems would be ironed out. Certainly, it came with lots of promise and potential. I loved the thoughts of the route, the prospects of entertainment after every kilometre, the pacers for all abilities … not to mention the t-shirts, free pictures and so on. I’ll elaborate on those points later. However, spoiler alert before reading on any further … I absolutely loved it! I had booked the race ages ago and by happy coincidence the world’s greatest band – U2 – then confirmed a gig at Twickenham Stadium the night before, so it promised to be an absolutely stonking weekend. And it was. Of course, my usual stunt of booking ridiculously early flights meant I was on the go from just after 1am on Saturday morning – and between travelling to London, spending a day in the city, the gig itself and making our way back from Richmond to our hotel meant I didn’t actually get to bed until after midnight Saturday into Sunday … perfect prep for a race, don’t you think? But, waking up on Sunday morning after a few hours blissful rest, I felt remarkably fresh although obviously very tired. Maybe it’s because I’ve done a fair few races now that I don’t stress or worry as much pre-event these days although I did wonder at one point if I was almost too blasé about it. I didn’t even pay too much attention to the pre-race info until the morning. Obviously I had a rough idea of where I needed to be and when, but this wasn’t the military operation it might have been in the past. Anyway, getting into Piccadilly I took my wife, Isobel, for a quick reccy around the areas she needed to be and then took a call from my best mate Dawn who rang to wish me luck. She had hoped to be there herself, and was gutted she couldn’t be, but that would have meant a 4am start and a three-hour bus journey. That’s effort enough as it is on it’s own, but considering less than twelve hours earlier she was still in the midst of her final long training walk for the forthcoming Cotswold Way Mighty Hike it was no real surprise she didn’t make it. She already goes way above and beyond in her support of me, but for the next little while rightly needs to focus on her own event (btw, please considering sponsoring her for Macmillan Cancer Support). Back to the job in hand, after finalising arrangements with Isobel I made my way into the starting pens and probably my only real gripe of the whole event. It was a blistering hot day – 27ºC/80.6ºF – so obviously keeping hydrated was going to be an issue … except I couldn’t see any water stations anywhere before the start. Perhaps there was and I missed them, if so I apologise, but I made a point of looking and honestly couldn’t see any. It was my fourth big event in London this year alone, all the others had water available beforehand so I can be perhaps forgiven for assuming the same again. That aside, the pens seemed well organised. I was in pen F, so quite a bit back, but as soon as the front runners left at 9:30am there was a steady flow as we made our way to the start line. No hanging around, no exciting build up and then nothing … just a gradually increasing sense of occasion. I spotted my preferred pacer in my pen, so I had a quick chat with her to ascertain her tactics. I’m not normally quick enough to have a pacer available so this was a *very* welcome addition. Starting the race at just before 10am (if memory serves) I made a point of keeping the pacer where I could see her. The first kilometre brought us down to just before where Piccadilly Circus joins with Regent Street and I was bang on the pace, a decent start. The route then went ‘up’ Regent Street, an incline of around 30 feet, during which I lost eight seconds but the turning point, which took us back down the other side, through the Circus and onto Pall Mall meant I was able to actually get slightly ahead of where I’d wanted to be at that point. In fact, I remained more or less on target until the halfway point which, given my recent poor form, both delighted and surprised me. So far so good. Unfortunately, the heat of the morning began to sap my strength. I knew that I was going to lose time so I changed my tactics to just wanting to end feeling happy with my run. With that in mind, I decided to ‘rest’ a little from the fifth to seventh kilometres which I knew would take us onto the Embankment. During the London Marathon reaching the Embankment always gave me a massive boost so I figured that returning to it again for this albeit much smaller race would have a similar effect. I mean, who couldn’t find a little extra something from somewhere when presented with the Eye to one side of you and the Houses of Parliament/Big Ben to the front? The course then took us over Westminster Bridge – I hadn’t been there since I ran the three London Marathon finishes in one night – so it was really nice to return, before a quick jaunt around Parliament Square and onto Whitehall for the finish outside Downing Street. As I’d said earlier, I wanted to end happy with my run and whilst the time wasn’t great it was better than my last few 10ks which, given the searing heat, was bloody good! I aimed for each of the final three kilometres to be faster than the one before and they were. Job done. Granted, I might have taken a little too much out of myself at the finish because I immediately began to feel quite dizzy and faint so, unusually for me, I sat down on the side of the road to recover. Then, after locating Isobel, I felt dizzy again so downed a bottle of Lucozade Sport almost in one go whilst clinging onto a barrier to steady myself. I was buzzing after that!!! I know I was disappointed with the lack of water available pre-race but the same criticisms couldn’t be made of the finish – there were loads of drinks available and you were welcome to avail of as many as you liked. I’m not exactly sure how many were in the goody bag itself because as soon as Isobel saw me she stuffed at least another couple of bottles in there that she’d bought for me whilst I was running, and some Jelly Babies which tasted wonderful! Speaking of the goody bag, I might run like a girl but I don’t have the physique of one (well, moobs, maybe!!!) so the ladies t-shirt I got was a bit of a let down but, to the credit of the organisers, by the time I checked my emails that evening I got a message stating they were aware of a problem surrounding the t-shirts and that anyone affected should contact them. You can’t ask fairer than that, a very impressive and prompt reaction. All in all, a very enjoyable experience. At the time of writing I haven’t seen the free pictures yet and I’m not sure what organisational problems were reported in the past but the organisers aren’t too far from putting on the ideal event. I love running in London and had said before that I’ll do a couple of the big 10k’s this year and another couple next year but that’ll mean missing out on this race in 2018 which would be a real shame. I’ll need to either rethink my plans or come into a lot of money! Next Running like a ….. zombie!